Honorable Mention Award - Commercial and Industrial category from West Michigan Chapter of the AIA as recorded in the Michigan Society of Architects monthly publication. Photo accompanying honorable Mention award in the category of Industrial Commercial Buildings from West Michigan Chapter of the AIA as recorded in the Michigan Society of Architects monthly publication. No credit found for this photograph in the publication. Grand Rapids is in the midst of unprecedented growth. Old buildings are being snapped up, renovated and reused. 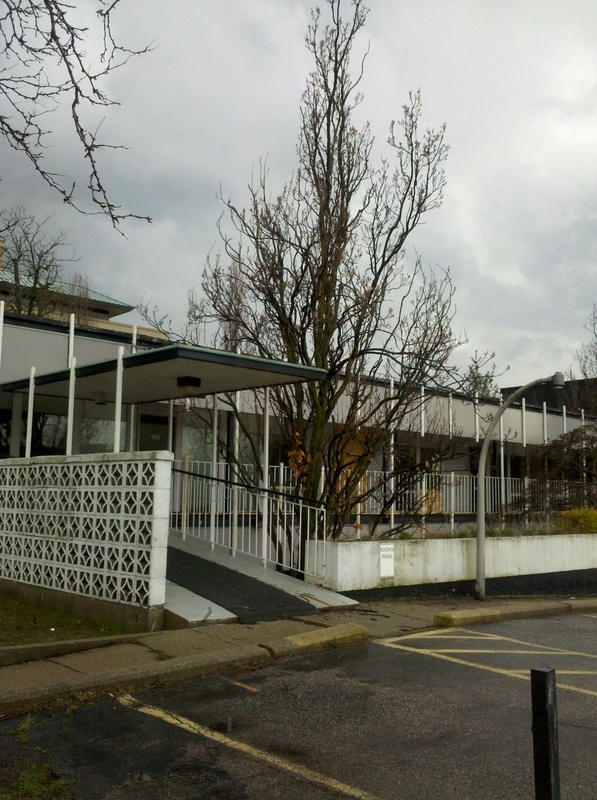 That makes it even more puzzling to see this amazing and modestly sized former medical office standing vacant and unloved. To many Grand Rapidians the Lafayette Medical Center, opened in 1960, may not seem historic. However, when buildings are more than 50 years old they are classified by the historic preservation community as part of the "recent past." 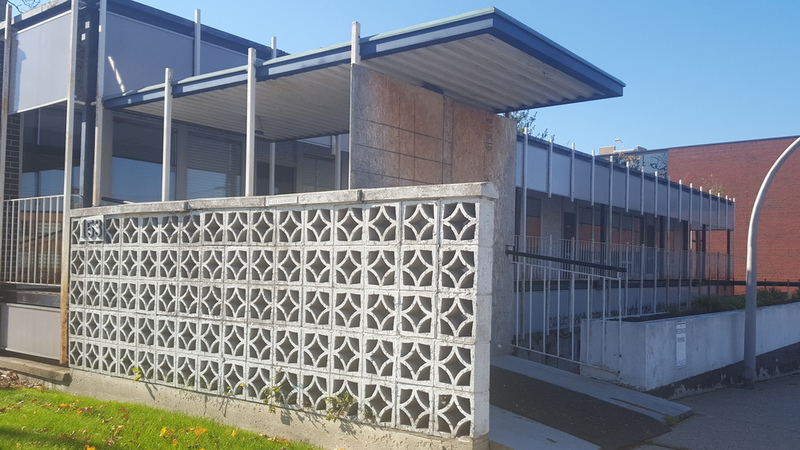 The term describes many wonderful mid-century commercial structures that are being "rediscovered" at time when they are often in critical need of repair and restoration. 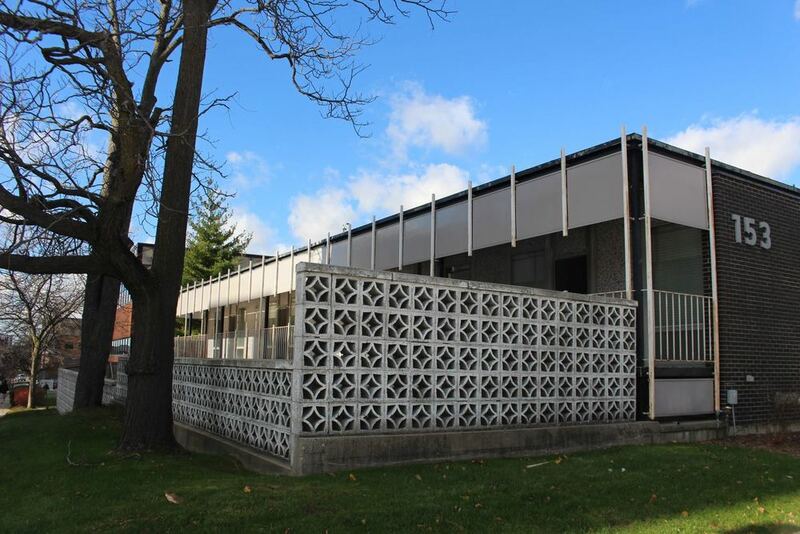 And this is a time when the city of Grand Rapids Historic Preservation Commission is looking at mid-century buildings located in official historic districts with new eyes. 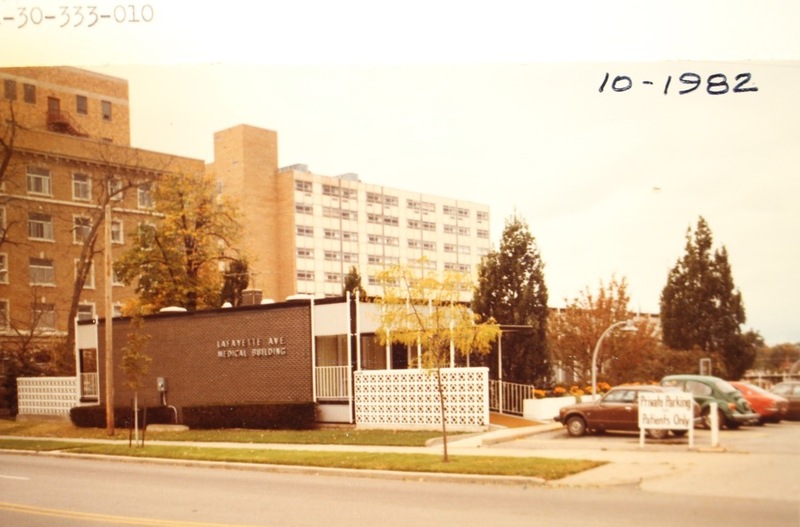 When completed in 1960, the Lafayette Medical Center received an Honorable Mention Award for Commercial - Industrial Buildings from the West Michigan Chapter of the American Institute of Architects. 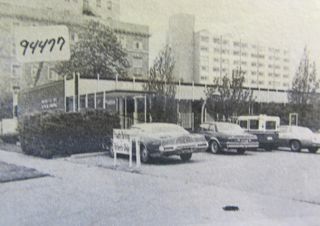 Now about 58 years later, the building is in rough shape. It is vacant and sustained fire damage. in the past year, it was painted over - everything from the brick to panels of tiny Italian tiles. E. John Knapp described the process of designing this building as follows. Knapp's firm (Obryon and Knapp) was hired by Edward Thompson, an anesthesiologist at St. Mary's Hospital, to design a medical office building on the corner of Lafayette and Cherry Streets. Thompson interviewed several architectural firms and Knapp remembers that they got the job because he was the only architect who really explained the whole process from design to build. Knapp enjoyed working with Thompson because he gave him freedom of design with few restrictions. 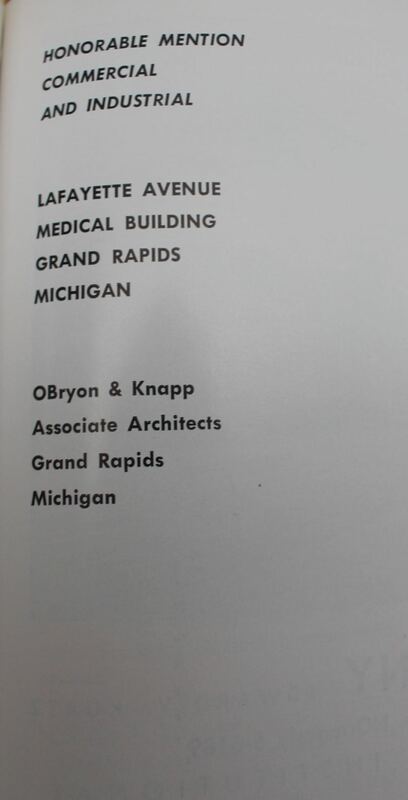 Thompson had several medical people already committed to his building so Knapp was also able to incorporate their specific needs. Thompson liked Knapp's original sketches and okayed the design. When you look at the building, Knapp's signature module structure is easy to identify. 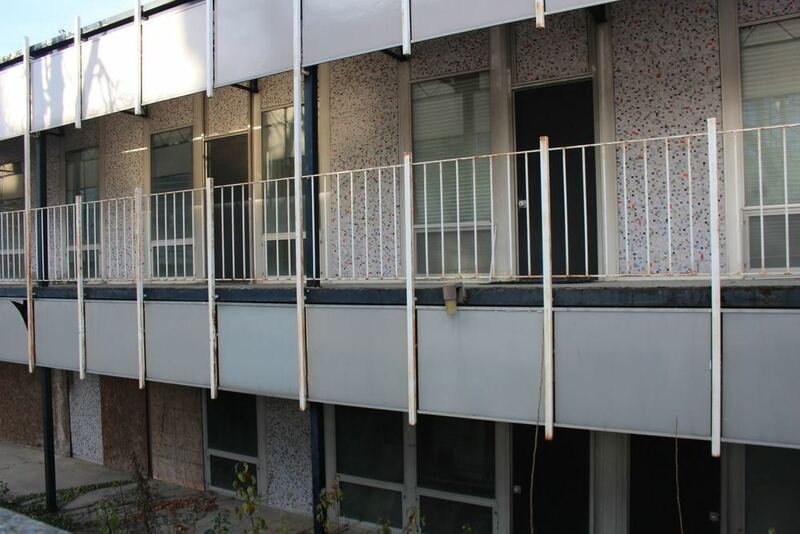 The structure consisted of load-bearing cement block walls covered in brick veneer and ceramic tile trim. There were 52 rooms arranged in 8 suites. 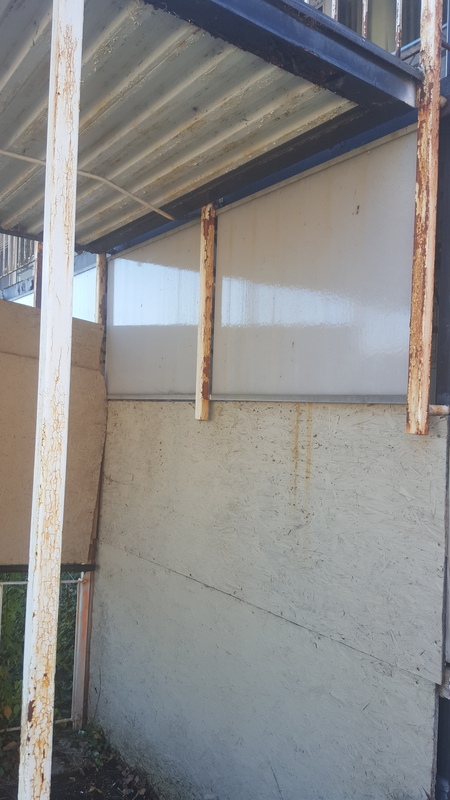 The interior walls were double layers of laminated plaster board painted and some with plywood paneling. The ceilings were plasterboard and suspended acoustical tile. In keeping with his view of the importance of connectivity between nature and architecture, Knapp added an outdoor courtyard to the lower level and connected the two floors with a ramp and a stylish open stairway on the exterior. 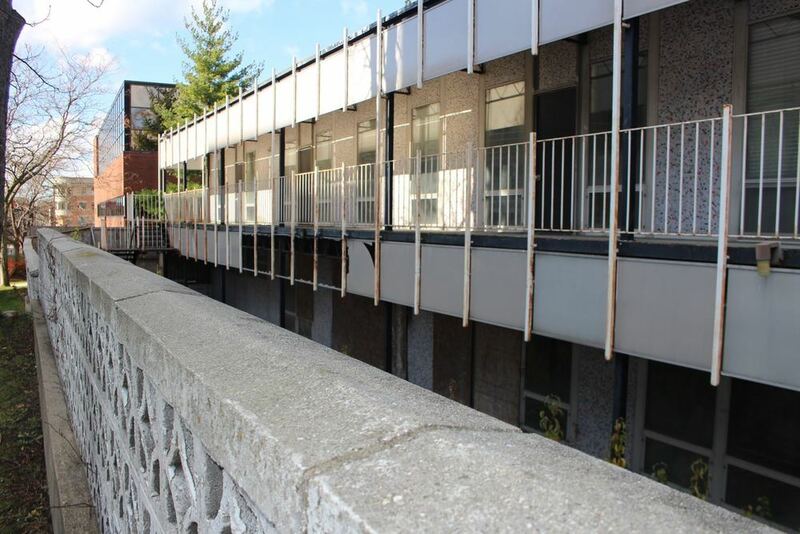 He used the popular mid-century "lattice style" concrete blocks to reinforce the horizontality of the structure. The blocks make a bold decorative statement on the front of the building. When it came time to choose materials for the facade, Knapp listed several possibilities to Thompson. The idea he liked best was tile, so they went to Detroit to see an Italian tile-maker, work out the design concept and pick the tiles. The tile-maker, who Knapp remembers as a "very small wiry man," made up the tiles in a modular format measuring 4 x 8 feet. He brought the tiles to Grand Rapids and installed them himself. When asked how he felt about the condition of the building. Knapp's daughter Marcia said, "He’s not happy about it but he recognizes that it happens … It's sad because it is such a pure example of his design without client restrictions." Knapp's daughter shared Knapp's philosophy, calling it "the three-legged stool."